Zivix, LLC announced it has partnered with Indiegogo to launch a crowdfunding campaign for its popular JamStik, a portable, easy-to-use guitar-like instrument for iOS. Recently named a winner of the Popular Science 2013 Invention Awards, the JamStik enables a new dimension for learning, experiencing music and giving both novice and experienced players access to hundreds of existing midi-based applications. Over a span of 40 days, the campaign aims to raise $100,000, which will go toward prototypes, tooling, manufacturing set-up and consumer experience enhancements. 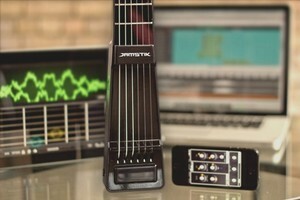 Making its debut in Las Vegas at the 2013 Consumer Electronics Show (CES) in January, Zivix demonstrated for attendees how JamStik bridges music with mobile technology to provide consumers with a real-time, life-like guitar experience on the go. The easy-to-use instrument transforms your mobile device into a guitar speaker and musical interface with real strings and frets that users can pluck and play while experiencing the real “feel” of a traditional guitar. Based on the company’s multi-patented IR fingertip-sensing technology, JamStik delivers an authentic guitar experience in a mobile-friendly style and with mobile-friendly connectivity. Zivix’s proprietary, multi-patented (more than 90 claims), optical fingertip-sensing technology, which makes guitars compatible with the digital world, is at the heart of JamStik. This technology is unique in being able to precisely locate the position of the user’s fingers even before they touch the strings. High-speed scanning of all finger positions ensures there is virtually no latency. Since JamStik is a digital instrument, users do not have to tune it, which makes it easy for beginners. When they are ready, users can transfer the skills they learn on JamStik to a guitar. JamTutor is a truly interactive system that teaches entry-level guitar. Users can actually see where their fingers are on JamStik’s frets, get instant feedback, and learn at their own pace. Using a variety of interactive game-like activities within JamTutor lets users learn and play songs in fun, engaging and rewarding way. JamMix is a hybrid experience that combines guitar and DJ elements for instant action for both beginners and advanced players. JamMix enables players to mix loops, sounds and instruments on the fly to explore and create original music. Over the past couple of years, crowdfunding has emerged as an alternative to the traditional Venture Capital or Angel investment route for start-up companies or products looking for funding. Launched as a collective public effort to fund companies and products, individuals have the ability to invest money in a product or cause based on tiered investments. In most cases each investment tier is accompanied by a return for the investor with the reward being early product access, mention as an investor in the campaign product campaign, or the ability to show support at an early stage for a new and exciting idea. Indiegogo, an international crowdfunding site and crowdfunding partner of JamStik, is headquartered in San Francisco, Calif., and has hosted over 100,000 funding campaigns in the music, charity, small business and film space. The Zivix team, located in Minneapolis, Minnesota, needs funding to get the JamStik in the hands of guitar players, both expert and novice, throughout the United States. For contributing to this Indiegogo campaign, Zivix is offering various rewards in appreciation. Everyone who donates $25 will have their name creatively displayed on the Founder’s Page at JamStik.com, which will be incorporated into the JamStik Founder’s Poster design, as well as exclusive progress updates and a JamStik-backer T-shirt. Those who donate $50 to the campaign will additionally receive a $35 discount coupon towards their future purchase of a JamStik. Other rewards include owning the JamStik prior to in-store and online availability, an option for an exclusive numbered version of the JamStik, receiving developer credit and being personally invited to attend Zivix’s official JamStik release party as a VIP.